NetEnt has just released a new promotional video for their upcoming slot Lost Island. 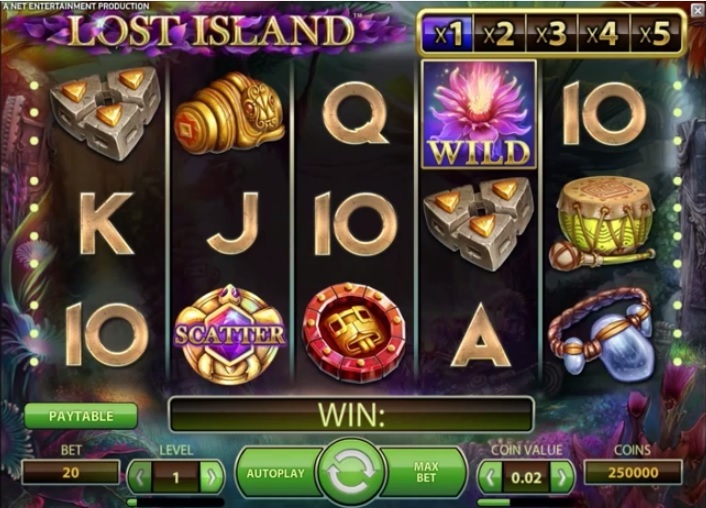 Lost Island is a 20 line slot game that uses a progressive multiplier. For each wild symbol that lands on the reels the multiplier will go up to a maximum of times 5. Lost Island also comes with a free spins feature. 3, 4 or 5 scatter symbols award 10, 20 or 30 free spins. During these free spins the middle symbol of reel 3 will stay wild and other wild symbols can appear stacked on all reels, so the multiplier has a much easier chance going up. I have no idea if more free spins can be triggered during the feature, but I believe it can. There hasn’t been a release date yet, but I think the game will go live at the end of July. In June we will see the release of The Wish Master, another very cool looking game. As soon as more information is available I will of course post it. Here is the promotional video of Lost Island.